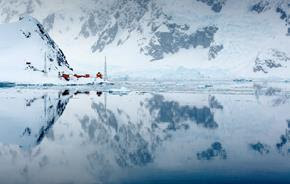 Antarctica has been inspiring explorers for centuries and this expedition offers you the chance to discover why, with an unforgettable journey through the spectacular wilderness of the South Shetland Islands and Antarctic Peninsula. You’ll encounter a world where nature creates the rules, her unpredictable temperament making each trip unique, exciting, and personal. Imagine cruising in a Zodiac through crackling sea ice like shattered glass, witnessing penguins building their nests, or navigating through a maze of icebergs, each one uniquely shaped by its journey through the sea. You’ll enjoy iconic Antarctic highlights, exhilarating adventures, and be rewarded with memories to last a lifetime. Join us for the Ultimate Bucket List trip, and support a fantastic local non-profit while you're at it!